PCN Flight West: NWA Capt. John J. Guerrero Jr.
NWA Capt. John J. Guerrero Jr.
NWA pilot Lt. Col. John J. Guerrero Jr. USAF Ret. LT. COL. JOHN J. GUERRERO, JR.
Lt. Col. John J. Guerrero, Jr. USAF Retired, age 69, passed away on July 17, 2014. 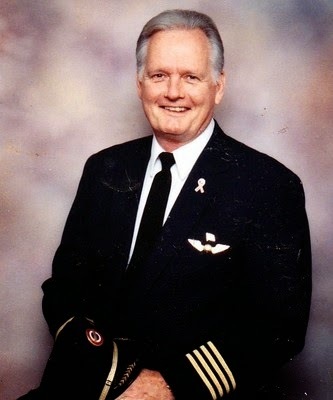 In addition to a distinguished career in the USAF retiring in 1990, John retired again in 2005 as a Senior Captain/Flight Instructor with Northwest Airlines. John had a life-saving Lung Transplant in October 2011 and was a survivor of 2 years and 9 months. He is survived by his lovely and caring wife of 45 years, Sandra Ruth Seeley Guerrero; daughter, Krista Lizak; sons, Sean Guerrero and Morgan Guerrero; mother, Becky Back Guerrero; sisters, Cheryll Guerrero and Laurel Henry; five grandchildren; and three great-grandchildren; as well as a host of loving family members and friends. In lieu of flowers, John requests that a donation be made to the Gabriel House of Care, 4599 Worrall Way, Jacksonville, FL 32224, located on the Mayo Clinic Campus. Please visit our online Tribute at www.quinn-shalz.com Arrangements by Quinn-Shalz Family Funeral Home, Jacksonville Beach, FL.